LiveCode LessonsLiveCode LessonsHow To - Step-By-Step Guides To Tasks In LiveCode LiveCode tipsHow do I Create an HTML E-Mail? 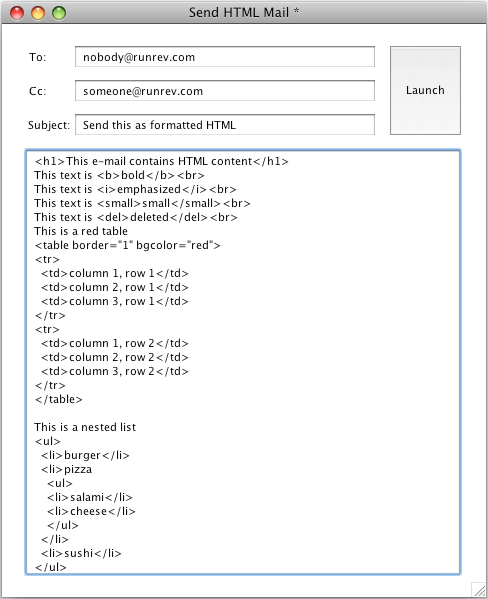 This lesson describes how to launch a new e-mail compose window from within LiveCode and populate the message body with HTML content. Example code is provided. Refer to How do I Attach a File to an E-mail? for information on how to expand this lesson to include attachments. Note: This lesson assumes that you are using Thunderbird as your default e-mail client. Instructions on setting up Thunderbird are not provided here. LiveCode supports revMail and revMailUnicode to send e-mail via the local e-mail client. This feature is great for sending text based e-mail or data from your online forms. The underlying mailto protocol that is used by LiveCode and is supported by most e-mail clients is limited and does not support attachments or HTML. Some e-mail clients do allow you to pass HTML via the mailto protocol body token, but there is no uniform convention for this. There are alternatives to using the mailto protocol, and this lesson shows you one such alternative. It uses the Thunderbird command line interface to add the richness of HTML to an e-mail that was created by a LiveCode stack. Interacting with the e-mail client via the command line interface is very similar to the way revMail and revMailUnicode interact with e-mail clients over the mailto protocol. This allows us to write surprisingly short and powerful code. The first step is to set up a user interface through which we can collect the information that is sent to the e-mail client. We create Text Entry Fields for the To: e-mail addresses, the Cc: e-mail addresses, the Subject: line and the message body. Give the To: field the name toField, the Cc: field the name ccField, the Subject: field the name subjectField and the body field the name bodyField. LiveCode uses the names to look up the content of the fields when creating the string for the command line interface. We also have to add a button that tells LiveCode to send a message to the command line interface of the e-mail client. Give the button the name Launch. For demonstration purposes, the fields in the above figure have been populated with values. There is one e-mail address in the To: field and one e-mail address in the Cc: field. Thunderbird accepts comma delimited e-mail addresses, allowing you to add several recipients to the To: and Cc: fields. 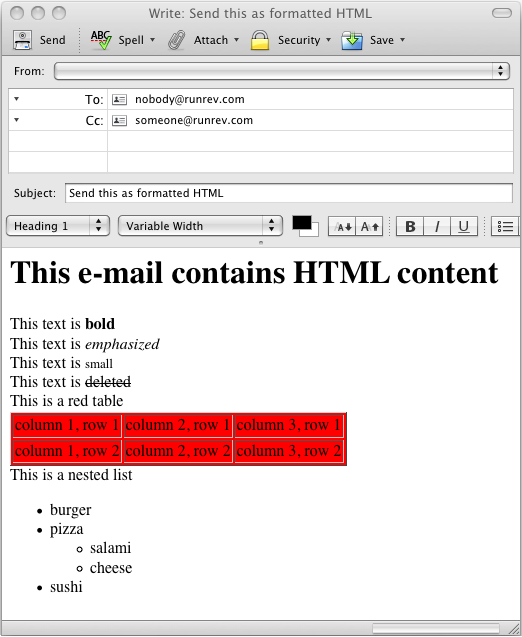 The body contains a number of HTML examples that will later be rendered and formatted by the e-mail client. All information included in the e-mail, from the addresses to the message body, is wrapped into one single text string that is then passed, via the Thunderbird command line interface, to the Thunderbird command line interpreter. The text string is the only variable we have to declare for this application. Add this variable declaration to the on mouseUp call of button Launch. The following code extracts the data from the fields of the user interface and calls the command populateLaunchString to wrap the data into lvLaunchString. You should also add this code to the on mouseUp call of button Launch. populateLaunchString lvLaunchString, "to=", the text of field "toField"
populateLaunchString lvLaunchString, "cc=", the text of field "ccField"
populateLaunchString lvLaunchString, "subject=", the text of field "subjectField"
populateLaunchString lvLaunchString, "body=", the text of field "bodyField"
We have to spend some time setting up conditions that allow us to interface with Thunderbird in different environments. Thunderbird is an independent application that does not come with LiveCode and hence has its own installation paths and platform specific configurations. The following code allows us to set values that are platform specific and apply to MacOS and Windows. The Thunderbird paths shown here are specific to the machines on which the stack was tested, when writing this lesson. It is possible that Thunderbird is installed in a different location on your machine. This code should also be added to the on mouseUp call of button Launch. The following code assembles the information from the user interface into lvLaunchString. This code is wrapped into a command declaration that should be placed on the button Launch card, but outside of the on mouseUp call. The command takes three parameters. The first one is a pointer to lvLaunchString itself. The second parameter is a token that the Thunderbird command line interpreter uses to identify the content that follows the token. The third argument is the content that the Thunderbird command line interpreter should associate with the token. For example, if we get the token cc= and the argument someone@runrev.com, then Thunderbird knows that we are sending an e-mail address that should be placed on the Cc line of the e-mail. The last section of code should be added to the end of the on mouseUp call of button Launch. This code creates a command process that sends lvLaunchString to the shell. We tell LiveCode to hide the console window, this allows us to launch the Thunderbird compose window silently. As you can see from the figure, the information from the LiveCode user interface is now placed in the corresponding fields of the Thunderbird compose window. The HTML tokens have also been rendered and formatted HTML text is displayed. Note: This lesson has shown you how to create HTML formatted e-mails via the Thunderbird command line interface. It is important to be aware that the examples here do not test the content of the Text Fields for constructs that Thunderbird may interpret as command tokens and argument. Any production application that is designed around this lesson must ensure that Text Field data does not contain values that Thunderbird may interpret as a command. Next: How do I Attach a File to an E-Mail? This works for one message but what about generating several emails? The TB command line interface appears to only allow the creation of one message. Call it again and the TB GUI gives back a message saying it can only be opened once. Try to use Write Process ... instead of a second Open command and it is simply ignored.